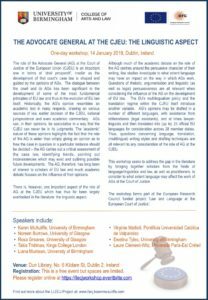 We are delighted to announce that our one-day workshop on The Advocate General at the CJEU: The Linguistic Aspect, has been rescheduled and will be held on the 14th of January in Dublin, Ireland. The aim of the workshop is to bring together scholars from diverse fields as well as practitioners, to consider the extent to which language may affect the work of Advocates General (AGs) at the Court of Justice of the European Union. The role of the Advocate General (AG) at the Court of Justice of the European Union (CJEU) is an important one in terms of ‘droit prospectif’, insofar as the development of that court’s case law is shaped and guided by the opinions of AGs. The dialogue between the court and its AGs has been significant in the development of some of the most fundamental principles of EU law and thus in the evolution of EU law itself. Historically, the AG’s opinion resembles an academic text in many respects, drawing on various sources of law, earlier decision of the CJEU, national jurisprudence and even academic commentary. AGs can, in their opinions, be speculative in a way that the CJEU can never be in its judgments. The ‘academic’ nature of those opinions highlights the fact that the role of the AG is wider than simply giving an opinion as to how the case in question in a particular instance should be decided – the AG carries out a critical assessment of the case law, identifying trends, pointing out inconsistencies which may exist and outlining possible future developments. The AG, therefore, has long been of interest to scholars of EU law and much academic debate focuses on the influence of their opinions. There is, however, one important aspect of the role of AG at the CJEU which has thus far been largely overlooked in the literature: the linguistic aspect. Although much of the academic debate on the role of the AG centres around the persuasive character of their writing, few studies investigate to what extent language may have an impact on the way in which AGs work. Questions of rhetoric, argumentation and linguistic (as well as legal) persuasiveness are all relevant when considering the influence of the AG on the development of EU law. The EU’s multilingualism policy and the translation regime within the CJEU itself introduce another variable. AG’s opinions may be drafted in a number of different languages, with assistance from référendaires (legal assistants), and at times lawyer-linguists and then translated into (up to) 23 official EU languages for consideration across 28 member states. Thus, questions concerning language, translation, (multilingual) writing styles and drafting techniques are all relevant to any consideration of the role of AG at the CJEU.